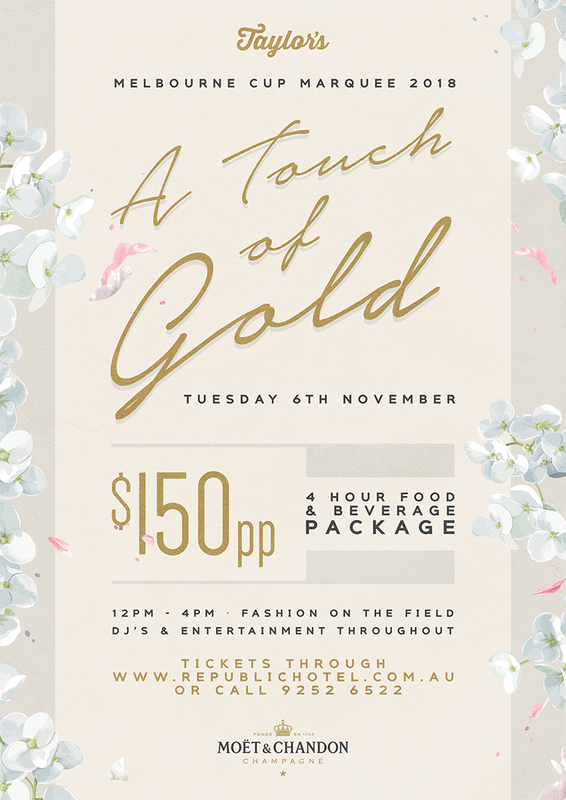 Elevate into the 2018 Melbourne cup Taylor's Rooftop Marquee with 'A Touch Of Gold'! An inner city urban oasis transformed into a lush green wonderland, be greeted with champagne on arrival, indulge in a 4 hour dégustation of light and substantial canapes while you and your friends enjoy the race that stops the nation. 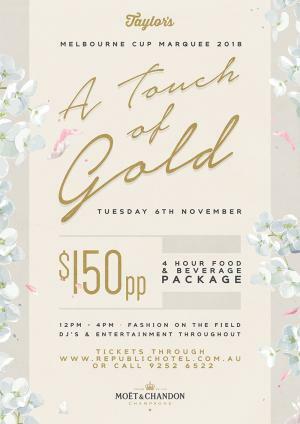 A premium 4 hour beverage package will ease your nerves as the day edges closer to the big race, enjoy music from well known Sydney DJ's throughout the day while your host & MC presents fashion on the field.Taylor's Marquee is your inner city premium offering for your 2018 Melbourne cup celebrations. Tickets are strictly limited, to purchase tickets please hit the ticket button below! Sweeps, Best dressed prizes, TAB facilities, Live entertainment. Taylor's and The Republic Hotel practices RSA at all times. Security and management reserve the right to remove any patron(s) from the venue whom they deem to be intoxicated or displaying inapropriate behaviour, regardless of being a ticket holder. © 2019 Ticketbooth on behalf of Taylors Bar. All sales are final. Tickets are non-refundable.